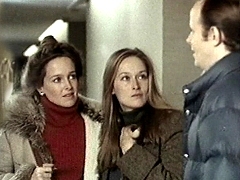 On this day 40 years ago, Meryl Streep was first seen by a broad television audience in the CBS movie of the week “The Deadliest Season”. 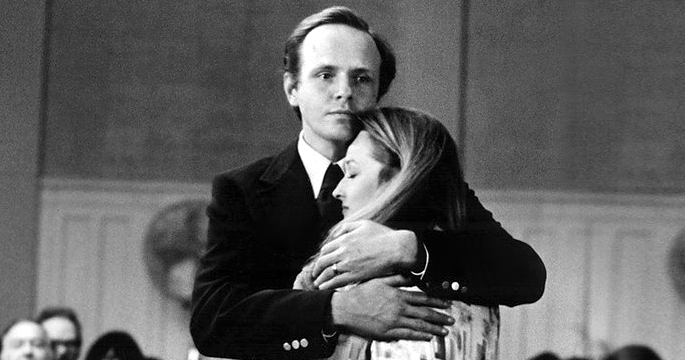 In it, Michael Moriarty plays a hockey player who struggles with getting older and uses more and more violent tricks on the field to remain in form, until one of his actions land him in court. 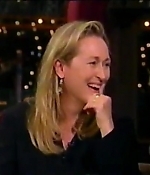 Meryl Streep plays his wife, which says pretty much everything about her character – there’s not much to do or anything poignant to say (if you don’t count “When I watched you in a game it turned me on”). 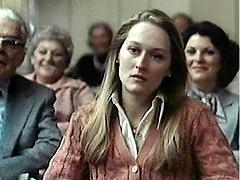 This short period of being an unknown film actress lasted for only a year until her breakthrough performances in “The Deer Hunter” and “Holocaust” in 1978, so it’s kind of fun to see Meryl Streep in a bit part, and how she manages to give this character depth and meaning after all. For more information about the film, visit the career page with additional production notes and pictures. To celebrate its anniversary, six exclusive clips have been added to the video archive, with many thanks to Simona for helping me out. Enjoy! 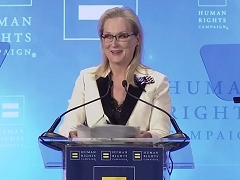 In January, Meryl Streep has lent her voice to the online platform “Now This” tribute video to 100 Years Of Women’s Health Care At Planned Parenthood – “the little-known history behind America’s most famous health care provider” and its trailblazer Margaret Sanger. 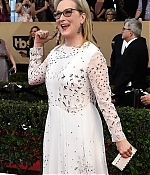 Additional voices are provided by Jennifer Lawrence, Mindy Kaling, Amy Schumer, Tessa Thompson, Gina Rodriguez and Lena Dunham, who also co-directed the video with Natalie Berkus, Kirsten Lepore and Alex Ronan. Many thanks to Alvaro for the heads-up. 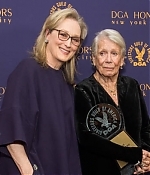 A new trailer released on Tuesday reveals that Meryl Streep narrated the three-part docuseries, which is adapted from Mark Harris’ book of the same name and features interviews with Steven Spielberg, Guillermo del Toro, Francis Ford Coppola, Paul Greengrass, and Lawrence Kasdan. Directed and produced by Laurent Bouzereau and written by Harris, Five Came Back offers a deep dive into Hollywood’s role in World War II by following five filmmakers who travelled to Europe to document the war effort: John Ford, William Wyler, John Huston, Frank Capra, and George Stevens. In the process of making the series, Bouzereau and his team collected over 100 hours of archival and newsreel footage; watched over 40 films from the five directors; and studied an additional 50 studio films and over 30 hours of outtakes and raw footage from their war films. “Five Came Back” debuts March 31 on Netflix. Many thanks to Frank for the heads-up. Photographer Brigitte Lacombe’s new book profiles women from all walks of life: from politicians to artists, journalists to teachers, and engineers to campaigners. But this is not a book about celebrities, though many of the subjects are well-known. These are women who have led their field, who have broken the mold to achieve, or who have inspired changes through relentless endeavor. Telling their stories through in-depth interviews, and illustrated with arresting photography by world-class photographer Brigitte Lacombe, this book will help and inspire women everywhere to realize their hopes and ambitions. 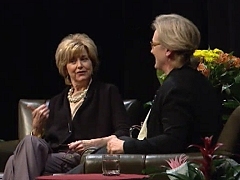 Subjects include journalist Tina Brown; Academy Award-winning actress Meryl Streep; actress, writer, and director Lena Dunham; Nobel Peace Laureate Leyman Gbowee; the first female fire fighter in the FDNY, Brenda Berkman; MP Mhairi Black; sailor Tracy Edwards; entrepreneur Jo Malone; and human rights activist Yeonmi Park. 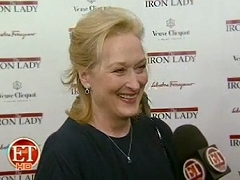 This update comes with a story, a personal one for Simply Streep. As you know this website runs in its 17th year, which is insane – it’s probably older than many of our visitors. Back in 1999, when I started this as a project, it was way harder to get hold of material. 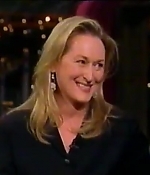 A fellow German, Anke, who has been a tremendous help over the years, sent me a VHS tape with some of Meryl’s talkshow appearances she did in the late 90s, among them her first visit on David Letterman’s late show, one of her first talkshow appearances. I had to learn the hard way that American NTSC tapes could not be played properly on European PAL recorders (in case any of you remembers a video cassette), so all faces turned out green like the Incredible Hulk and it was almost impossible to watch. 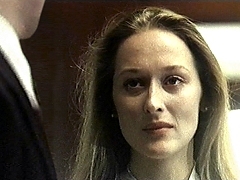 I tried just about everything to get a video copy for Simply Streep, but nothing worked out. So I just settled and thought, with Youtube and other sources emerging, “one day it’ll be on Youtube”. That thought came and went for the past 17 years. Well, mark you calendars. Today, with many thanks to Youtuber Daniel Poitras, the Letterman appearance has been posted in its entirity, and in good old fashioned VHS quality. The interview runs for a whopping 13 minutes, which is so much more than today’s talkshow snippets. Also, she gives the best excuse for declining to appear on Letterman’s show for 20 years. 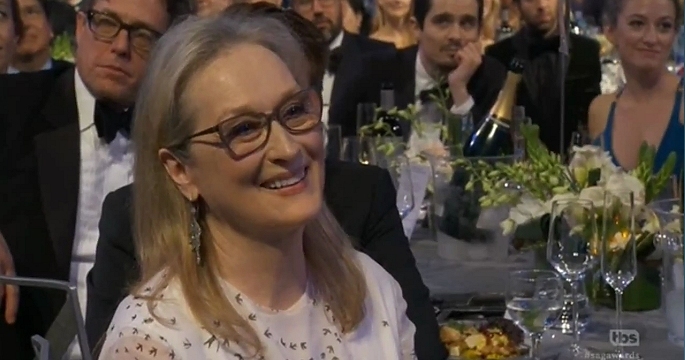 I’m so happ to finally add this to the archive, it makes Simply Streep feel a whole lot more complete. Enjoy the clip and make sure to view the screencaptures in the photo gallery.